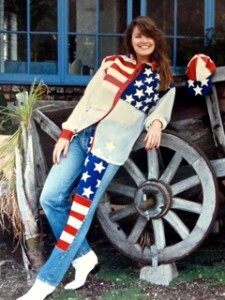 Just wanted to wish all my fans a very Happy 4th of July by sharing this vintage Leather Waves photo from 1994. DMP rocks this very America look with suede flags sewn to vintage Levi’s, a chiffon shirt with the same suede pattern and a baseball cap to finish it off. Enjoy your holiday and reflect on the many wonderful reasons to be a American!